Strong credibility with interactive communication . . . The owners of Pike Valley Farm asked for a clean, straightforward site in keeping with the character of their family-oriented organic farm. 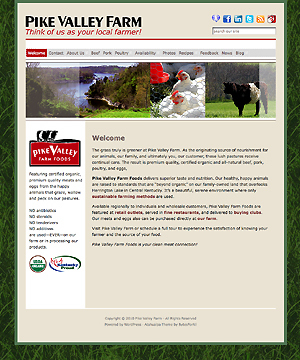 They also required a format rich with interactivity that could be self-managed and updated by the farm owners. Dixon Design created a site that fused a WordPress theme with photo gallery features, customized it for a distinctive look, and incorporated a style of blog that would appropriately complement the overall effect rather than dominate it. 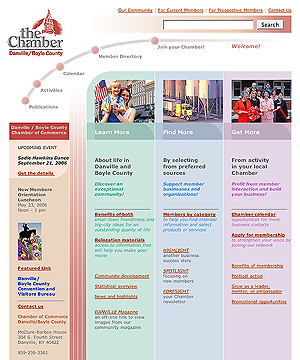 That was the assignment to Dixon Design when The Chamber wanted to improve both the look and functionality of their Website. 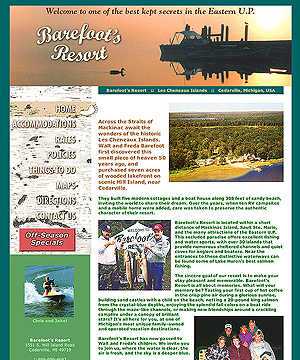 In addition to providing well-organized information to prospective tourists, the owners of Barefoot’s Resort wanted to display the beauty and family atmosphere of their fishing vacation spot. They looked to Dixon Design to interpret their personal style and vision. 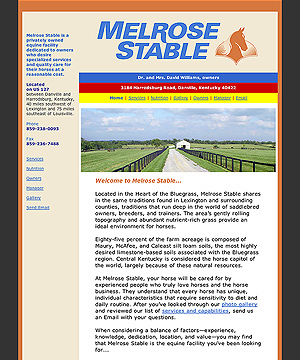 The owners of Melrose Stable wanted an uncluttered site to explain the benefits of their expertise to other saddlebred horse enthusiasts. Dixon Design used clean, but slightly modified typography to give the site a distinctive look. Having produced a past World Grand Champion Junior Three-Gaited, the owners of Melrose Stable requested that our firm proudly feature the colors of the renowned tri-color ribbon.